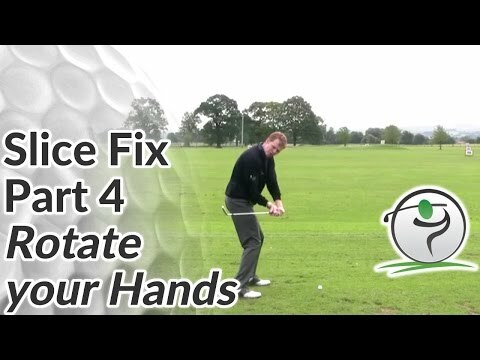 Golf Slice Fix Part 4 – Golf lesson and golf tips on how you may be able to stop slicing the ball if you focus on rotating your hands correctly through impact. If you’ve done the previous part correctly – part 3 – you may find out that balls are sent straight out to the right; this is normal and represents a key step in curing your slice. The next step involves the rotation of the hands at impact, and its effect on the clubface angle. Practice making swings with a correct top of the swing position and a correct downswing initiation via the right elbow coming down towards the hip. When the club shaft is parallel to the ground on its way down, train your trailing hand – right hand – to overcome the left hand gradually. Failing to rotate your hands correctly will result in a clubface that presents itself at impact in an open position, helping send the ball on a slice path. It will take some practice to get the timing just right but it will be worth the effort.